All offices, whether online or brick and mortar operations, need space to work out from. With improved technology enabling distributed workforces and travel options enabling access to hitherto remote areas of a city, economical office space is not too difficult to find. However, every now and then, the distributed workforce needs to come together and the office in a remote area needs to mark its presence in or near a central business district (CBD). But hiring office space for these infrequent needs is uneconomical. In CBDs of metros like Mumbai and Delhi, the average rent of grade A office space can be more than Rs250 per sq ft. Add to this the cost of setting up and maintaining the space, and the fact that commercial spaces are usually let out as long-term leases. As a result, prime real estate was considered to be beyond the reach of most start-ups, small business, and even many established professionals. No more. There are many options to renting office space in a CBD, especially for a small number of people or for short periods. Let’s explore these options a bit more. To cater to emerging businesses, start-ups and professionals, many companies have started offering different types of office spaces such as business centres, or serviced offices, co-working spaces, and even virtual offices. “These office spaces were not very prevalent two years ago but last year the co-working footprint has increased considerably. Currently, more than 160 operators facilitate co-working offices with over 350 operational centres across various Tier I and Tier II cities in India,” said Surabhi Arora, senior associate director, research, Colliers International India. A co-working space is usually an open floor-format office with shared spaces for meetings and networking. These office spaces try to address the immediate needs of their customers. For instance, if a company organises a meeting only once a month in a city, or has very few employees in a place, or wants to employ some people only for a few months or weeks; they no longer need to get into a long-term lease for these short-term needs. “Just as serviced apartments offer concierge and numerous other services bundled with the apartment’s rent; desks or conference rooms in serviced offices (or business centres) can also be rented along with all the frills—for a higher price—rather than just the co-working spaces,” said Ramesh Nair, chief executive officer and country head, JLL India. While some co-working spaces are as expensive as serviced offices (or business centres), most of the co-working are more cost-effective than the serviced offices, he added. Apart from the above options, which provide physical space, virtual office space can also be used by home-run businesses and professionals. “They serve those who need mail and call support,” said Sumit Lakhani, chief marketing officer and sales head, Awfis Space Solutions. “Virtual offices are ideal for freelancers or entrepreneurs who spend most of their time travelling. These offices give you the convenience of a registered office address, where you can get your mail delivered and occasionally work from,” said Neetish Sarda, founder and managing director, Smartworks. Cost saving is the biggest benefit of such office spaces (see table). “Companies can save 15-20% by working in a co-working space, which (also) provide…plug-and-play amenities that bring them at par with grade-A offices,” said Nair. These are better suited for those with small teams that need office space in prime areas. “The occupiers of small set-ups, employing 25 to 50 people, can profit from a cost cut of at least 15-30% on capex initially,” said Arora. The other benefit is flexibility. You can rent these spaces on a monthly, daily or even hourly basis. You could also choose to work out of a cabin space, open space or even a meeting room. “We offer different options. Flexi seat are available at the rate of Rs300 per day per person or Rs. 8,000 to Rs 10,000 per month, or fix seats are available at Rs600 per day or Rs 9,000 to Rs13,000 per month,” said Lakhani. For meeting rooms, his company charges Rs350 an hour for spaces that can seat four, and Rs750 for spaces that can seat eight. The price varies based on location, facilities and amenities, added Lakhani. For instance, let us assume you have 10 employees and rent a 500 sq ft office at Rs200 per sq ft. It would cost you Rs1 lakh a month. If you opt for a co-working space, it too will cost you about Rs 10,000 per employee. However, while the per month rent may seem to be similar, it does not include the cost of equipping the office. 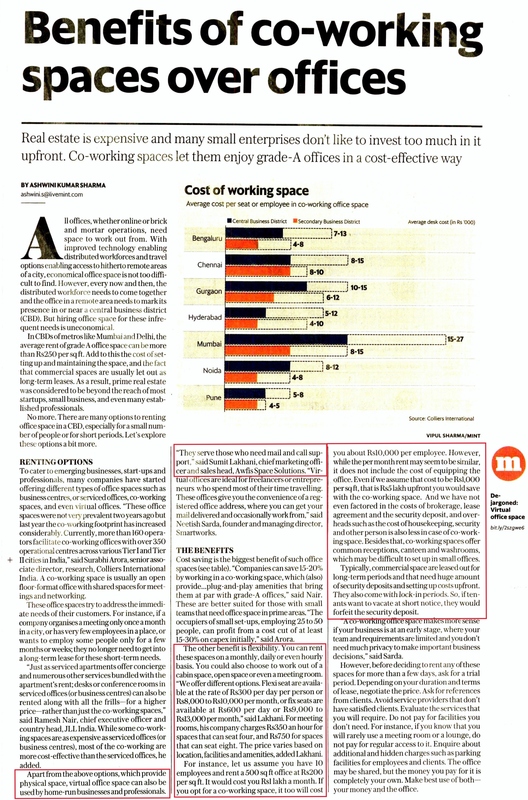 Even if we assume that cost to be Rs 1,000 per sq ft, that is Rs5 lakh upfront you would save with the co-working space. And we have not even factored in the costs of brokerage, lease agreement and the security deposit, and overheads such as the cost of housekeeping, security and other person is also less in case of co-working space. Besides that, co-working spaces offer common receptions, canteen and washrooms, which may be difficult to set up in small offices. Typically, commercial space are leased out for long-term periods and that need huge amount of security deposits and setting up costs upfront. They also come with lock-in periods. So, if tenants want to vacate at short notice, they would forfeit the security deposit. “A co-working office space makes more sense if your business is at an early stage, where your team and requirements are limited and you don’t need much privacy to make important business decisions,” said Sarda. However, before deciding to rent any of these spaces for more than a few days, ask for a trial period. Depending on your duration and terms of lease, negotiate the price. Ask for references from clients. Avoid service providers that don’t have satisfied clients. Evaluate the services that you will require. Do not pay for facilities you don’t need. For instance, if you know that you will rarely use a meeting room or a lounge, do not pay for regular access to it. Enquire about additional and hidden charges such as parking facilities for employees and clients. The office may be shared, but the money you pay for it is completely your own. Make best use of both—your money and the office.